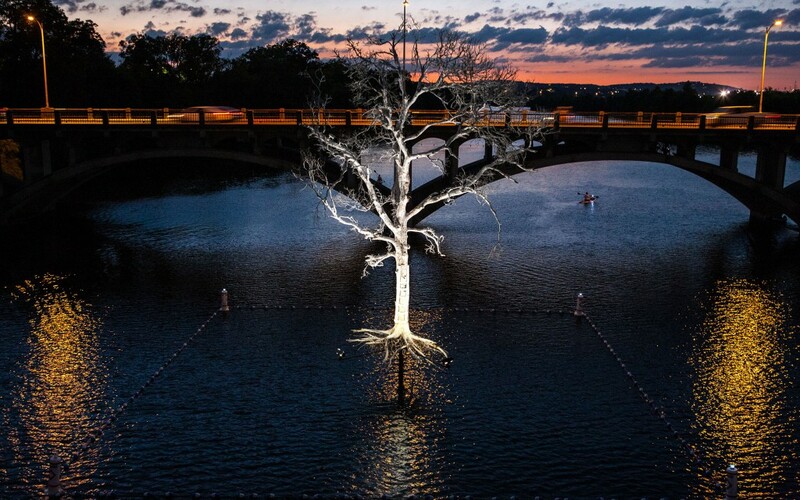 There’s a 5,000-pound ghost hovering over Austin’s Lady Bird Lake, the remains of a 35-foot cedar elm painted white and hoisted onto a shaft sunk into the water. Entitled Thirst, this collaborative project memorializes the estimated 301 million trees in Texas that have died in the current drought. It’s a haunting sight, this desiccated tree with its roots hovering just above the water that would have kept it alive. Looking at it and its reflection in the water, I couldn’t help but wonder about ghosts, who seem to reside in that gap between sustenance and death. When you can’t see the space that Thirst creates, the space between the roots reaching for the water and the water itself, it’s easy to forget that it exists when the roots are underground as well: that gap, that amazing gap across which roots somehow get the nutrients they need to grow—or don’t. The floating tree gives room to investigate that ghost-thick space in more-than-literal ways as well, a seasonally appropriate exploration as Halloween rolls its perky little way across our neighborhood. 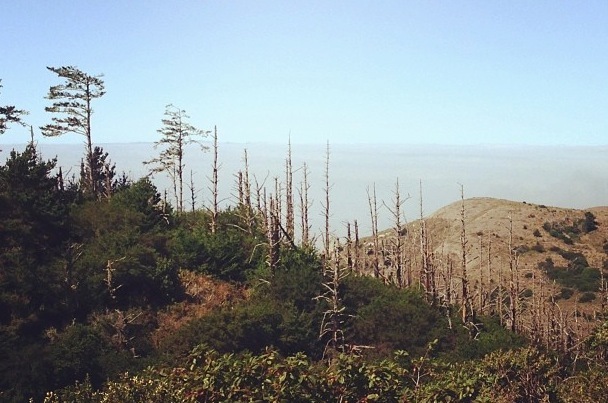 When Martin and I were in California last month, we went hiking through the area of the Mount Vision fire, which burned 12,000 acres of the Point Reyes National Seashore in 1995. Hundreds of charred trees—most of them Bishop pines—still stood in testament to the devastation of the fire, riding like gray ghosts on the backs of the hills galloping into the ocean. Despite the reminder they provided of pain and loss, I was struck by their place in the busy landscape. Woodpeckers, warblers, chickadees, hawks, and coyly hidden singers flew in and around the old ghosts, nesting, feeding, resting. Some of the dead trees had melted into mulch, providing cribs for numerous other species. I read later that Bishop pine cones, which grow in tight thick clusters on the parent pine’s branches, won’t release and open except with intense heat. Something about the scene reminded me of an afternoon I spent years ago walking through a predominantly Mexican cemetery on the west side of San Antonio, probably about this time of year, just before the Day of the Dead. Families were picnicking among the grave markers, many of which bore photos of the dead. Many of the dead were long gone and couldn’t possibly have known in life some of the generations gathered there, and yet there were balloons and fresh flowers and toddlers all bouncing through the scene. It was the first time I had seen this intentional, comfortable coexistence of the living and the dead, a reaching across the gap that usually separates them, and something lively was released. It’s easy to romanticize that gap, to say that it’s just a Ouija board’s journey from one side to the other, or to deny that any interpenetration across it is possible. One thing I know about the gap is that it’s often delivered in a placenta of suffering. Martin and I also just finished reading Goodbye to a River by John Graves, who died on July 31 of this year. Born in 1920 and raised in the Fort Worth area, Graves left Texas as a young man and returned in 1957 to take care of his ill father. In November of that year, when he heard that the Brazos River, the site of many adventures in his youth, was to be dammed, he decided to canoe and camp along the part of the river that he had known the best, between Possum Kingdom Lake and Lake Whitney, a trip of 200 or so miles that took about three weeks. He wrote not only about his adventures with “the passenger,” the dachshund pup that accompanied him, but also about the history of the river and its people. Graves had no patience for the myth of the noble “Anglo-Ams” (as he called the white settlers) who ousted the savage native Americans; his respect for the Comanche nation (“The People”) and other indigenous tribes was unfashionable at the time. His respect for the river and its environs was equally unusual at a time when the natural world shared the same degraded status as the Native American. At the same time, Graves was respectful of the Anglo-Ams whom he called “the old ones.” He had a particular fondness for Charles Goodnight, one of the namesakes of the famed Goodnight-Loving Trail, whose ranch Graves passed on his journey. Graves wrote of Goodnight, “He was a tough and bright and honorable man in tough not usually honorable times, and had respect and a kind of love for the Indians even when he fought them,” which was often. Graves tells a tale so haunting about Goodnight and The People that I think it must float, almost visible, around that bend of the Brazos, whether it happened or not. Because he was willing to engage with ghosts—especially the hairy, scary, foul-mouthed ones—John Graves’s voice is still audible somewhere in the gap between the floating tree and the river, through the interstices that link the living and the dead. Within those interstices, something lively is released—though released in the fires of suffering. No wonder we don’t like ghosts. But, oddly, they can tie us to a place, a history, and to each other, so long as we have time to tell their stories in that space between the river and the roots. It’s those interstices that allow for the development of unexpected and fruitful connections. This entry was posted in More and tagged bison, Charles Goodnight, Comanches, drought, ghosts, John Graves, Point Reyes National Seashore, San Antonio. Bookmark the permalink. I like the theme. It rings true to me. Especially beautiful today! I am driving up to John Graves country tomorrow to Stephenville, and will think about this all the way. Oh, dear Heather, thank you for this journey home. Tucking in, thinking of tomorrow’s poor sermon, I wish I had a small portion of your gift! Still, I rejoice that you share it with us. For a fuller version of John Graves’s Goodnight story, read “The Last Running” by John Graves—a wonderful fictionalized account of the meeting described in this post.